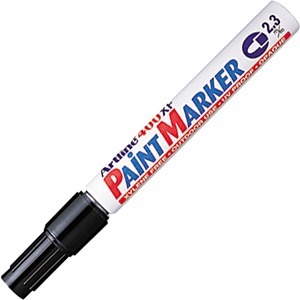 Artline Paint Marker is ideal for construction and industrial applications as well as arts and crafts projects. Specially designed for indoor/outdoor use, the permanent paint leaves an indelible, fully opaque, water-resistant and fade-resistant mark on nearly any surface: glass, metal, plastic, porcelain, wood and more. Fast-drying formula minimizes the potential for smears and smudges. Marker is xylene-free and features a 2.3mm bullet tip.